We had been together 5 months when my other half told me he was planning a trip to Thailand for 2 weeks and did I want to go with him. To be honest, my first thought was 'No way, I can't do that'. My next thought was 'I can't let him go without me' so the word Yes slipped out of my mouth before I could think anything else. That is when the rest of the thoughts flooded my mind. Thailand had never been on my bucket list and if I am being perfectly honest, the reason I said yes was because just a few months earlier, when I first met my boyfriend, he jetted off to Bali for 3 weeks and it was the hardest thing seeing him have fun with all these other people and I wasn't there with him. After this initial conversation, the flights got booked and we started planning our trip. For the next 9 months, we planned where we were going to go, booked our accommodation and our internal flights and decided what excursions we wanted to do. The more I researched Thailand the more excited I got. I was so nervous on the plane (for more than one reason) and we flew into Bangkok which was overwhelming in itself. Jet lag hit me that first night and we slept until 2pm on our first day, so we decided to catch an Uber into Bangkok City and explore. We got dropped off right outside Wat Pho Temple, which is where the reclining Buddha lives, so we decided to check it out. After still not really finding my feet in this weird and wonderful place yet, entering the temple did something to my state of mind. The worshipping rooms were so calm and quiet, people were just sitting with their own thoughts and it was at this point I actually started to relax and take in what was around me. Bangkok was such a wild experience, I saw my life flash before me in a tuk tuk, I saw some amazing architecture at Wat Pho and also the Grand Palace, I ate street food that cost about 50p and was absolutely delicious, but after 2 days I was ready to move on to a more relaxed and chilled vibe. Enter Chaing Mai. One of the most beautiful places I have ever visited. Picture quirky little eateries (a burger and spring rolls restaurant called... wait for it... 'Burgers and spring rolls'!! ), markets with fresh fruit, veg and fish, and the biggest night-time street market I've ever seen, known as the Chaing Mai Night Bazzaar. We spent 2 nights walking through this market and still didn't finish it. However there is a hidden gem in the midst of it all, about halfway down the markets, there is a square that hosted street food stalls, stalls selling little tidbits and a live band. Everyone was chilling, eating drinking and it really optimises what kind of place Chaing Mai is. It was here that I felt like I was getting a true picture of what Thailand was all about, the culture of the Thai people and I loved it. On one of our days, we had booked to spend the day with elephants, at the Elephant Sanctuary. This day I was most excited about and it did not disappoint. It was the most surreal day of my life, something I never thought I would get the opportunity to do. We fed them, we bathed with them and we made up medicine balls to give to them. We also booked onto a trip to zip wire through the jungle... I honestly thought I would be ok, despite my fear of heights and hurtling through the air and a great speed. I'd done go ape in the UK before so surely I would be fine right? Maybe not, me being the wimp that I am, only managed the first zip wire before refusing to do anymore (q me having to ride on the back of a moped with a member of the Thai police to get back to the base camp... not my finest moment). One of my favorite things we did in Chaing Mai was a Thai cooking class. It was booked last minute on our last night there and it was actually really enjoyable. If you love Thai food (why would you visit Thailand if you didn't?) then its something I would highly recommend. We met some lovely people from all over the world, the chefs who taught us were out-going, funny and made things really easy to follow and the food we cooked tasted amazing. Chaing Mai exceeded my expectations. 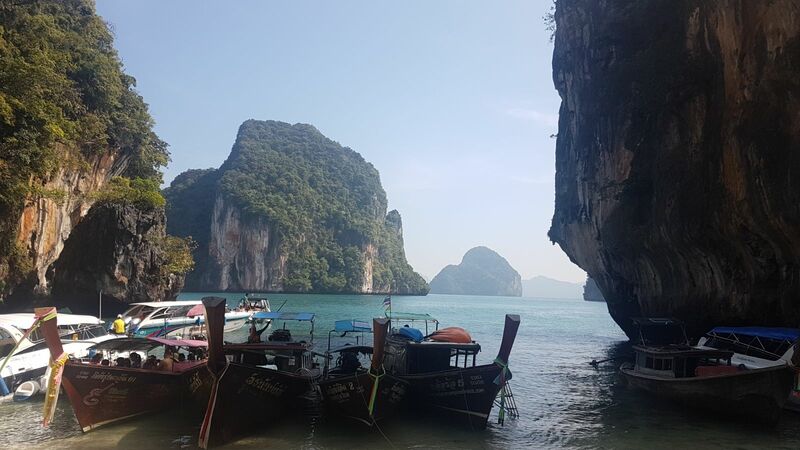 When people think of Thailand they think of the white sand beaches and the clear blue ocean, so they head for the islands to see that. I am so glad we saw some of North Thailand and would definitely recommend adding it to your itinerary should you be planning a trip there. Alas, we did make our way down south to the Islands, but so as to not make this post super long, I am going to split it into 2 parts. Part 2 will be coming tomorrow so keep your eyes peeled if you want to know more about my experience of Thailand!